Jeff Justice, CSP has been on the executive board of two networking groups, as well as director of training for the Atlanta Network Alliance. 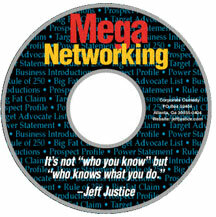 It’s a must for anyone who depends on networking to build their business. The cd also includes a worksheet to follow along with the program. The prospects you meet will never forget you or what you do again!